What it’s like practicing here. In your new position with UVA Medical Center, you’ll join an organization that truly values diversity. BlackDoctor.org named our system as one of 60 honorees on its inaugural 2018 “Top Hospitals For Diversity” list. In addition, Novant Health UVA Health System medical centers are two of the three facilities in Virginia recognized as “Leaders in LGBTQ Healthcare Equality” in 2017 by the Human Rights Campaign Foundation. We are a team of close-knit colleagues, not competitors. Our proven patient-first focus has earned us Magnet® designation and many other recognitions in recent years. Here your opinions, suggestions and expertise are welcomed and encouraged. You’ll have a voice in patient care decisions, access to the most advanced medical technologies, and a strong sense of satisfaction from making a difference in peoples’ lives every day. These are just a few of the reasons why U.S. News & World Report named us Virginia’s #1 hospital* for the third consecutive time. And why so many healthcare professionals who choose to join us, stay with us. 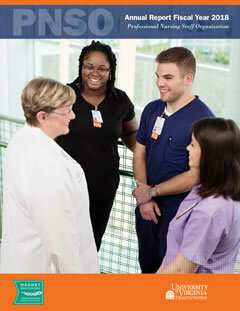 Explore our career options, and find your future at UVA Medical Center. For more reasons to consider a UVA career, click the link below to our 2018 PNSO Annual Nursing Report. It highlights recent hospital accomplishments, useful UVA information, and offers care and educational insights from UVA nurse leadership.